Since releasing the new intranet for the Royal Botanic Gardens, the team has been working to iterate functionality and implement features based on staff feedback and new requirements. 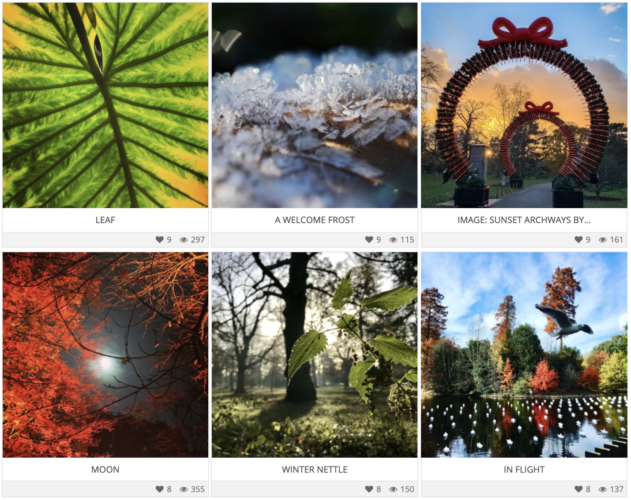 We’re gearing up for another photo competition on Kewnet, the intranet for the Royal Botanic Gardens. The first competition took place in the run up to Christmas with just a couple of weeks for staff to upload their photos and vote. 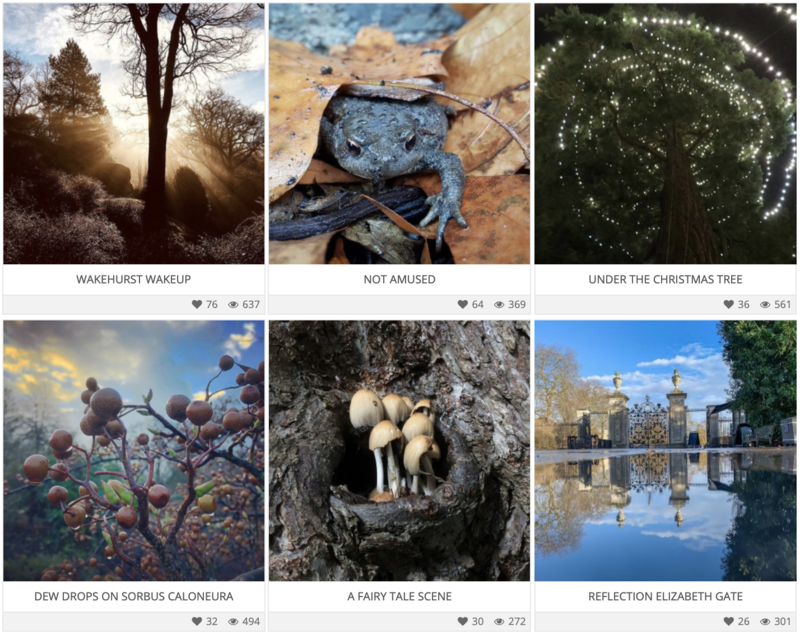 It generated some wonderful entries with winter scenes from the Royal Botanic Gardens, Kew and Wakehurst. We were eager to launch the competition before the Christmas holiday season, and feedback from staff has highlighted the problem of allowing voting while the entry period is in progress. It meant that people who left it to the last day got less chance of votes. So we’re fixing this on the next competition to allow a two week submission period followed by a week of voting. As a result of the staff photo competitions, Kewnet has a growing media library of gorgeous photos that can be used for news and promotional elements across the intranet pages. But you don’t have to be located in beautiful, natural surroundings to get some good photos. See how the ONS created a library of stock photos from around the office. Alexandre Antonelli, the new Director of Science at Kew, blogged about his first week in the role and ended the post with a challenge inviting feedback on the name for a new lunchtime seminar. The blog post generated a record-breaking number of comments from staff with ideas for the new name. 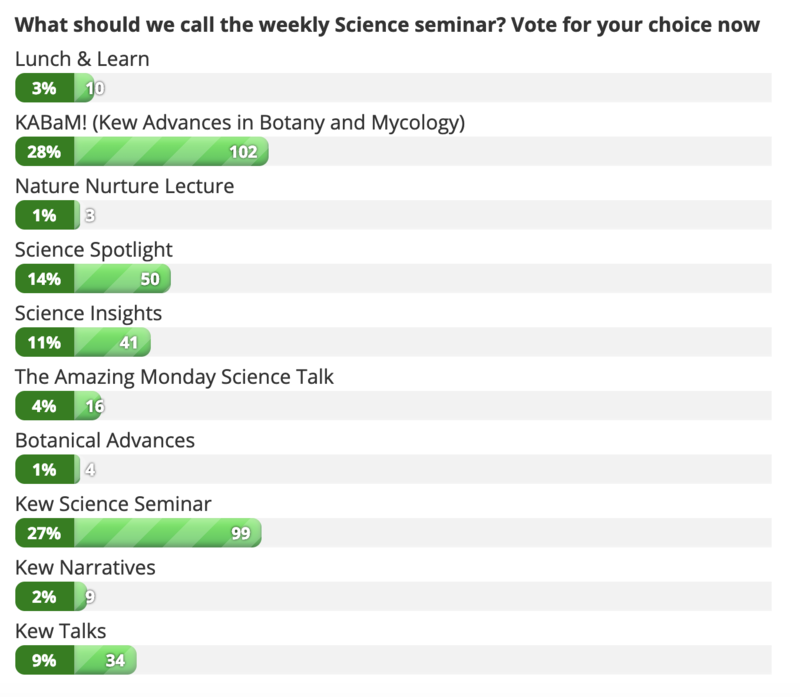 Rather than going all Boaty McBoatface, Kewnet polled staff on a closed set of ten suggestions that featured strongly in the comments. It was a close call, but the winning name was KABaM! 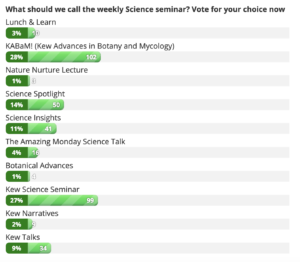 (Kew Advances in Botany and Mycology) and it was encouraging to see the regular seminar listed in the events section of Kewnet with the new name. A really good example of engagement and democracy on the intranet. The previous incarnation of Kewnet had a page to show expected visitors at the public entrance gates. It was a free-format, standard CMS page, that had grown into an inconsistent splurge of text in various styles of bold and italics and different fonts, all on a long page with no particular concept of chronology. The Visitor Hosting team used email to receive requests for additions to the list. Using GravityForms and some custom templates, we built a new page with a form for staff to add their visitors to the list on the gates. Staff on the public entrance gates can now see all expected visitors for the day on Kewnet, and can scroll through future entries. The data from the entries is being used for automated management reporting to analyse the types of visitors, which range from friends and family to music bands, interviewees, news reporters and media, to people from education, science and research sectors. There’s a new online form on Kewnet if you want to book the events crew. Reading the form, this is the team of ninjas who arrive at your event venue to transform it into whatever you specify on the form. It’s a complex form. Created in-house by the intranet administrator using GravityForms and a lot of conditional coding. This gives the front-end user a nice AJAX interface with form options that change according to requirements. So, choosing one venue will offer different seating plans to another, while some venues offer specialised lighting installations with a choice of colours. These changes are part of ongoing development on Kewnet to make processes more digital, moving away from email and document-based procedures toward useful online experiences, which ultimately save time and resources.